The pedal hop, in fact a pedal-kick-assisted hop, is what you'll use to hop over a large gap or to land your rear wheel with precision, hopping from one beam to another. Giacomo Coustellier over wood logs. Assuming you can lift the front wheel and bounce a couple of times on the rear wheel, you should be ready to focus on pedal hop transitions from one edge to another. Such transitions combine the power of a pedal kick with the spring action of both your legs and arms. In fact, you should use the whole bike as a cantilever to boost your impulse, pulling yourself on the handlebars to accelerate as you push with your legs and perform the pedal kick. The cantilever effect will work best if you keep your arms stretched. 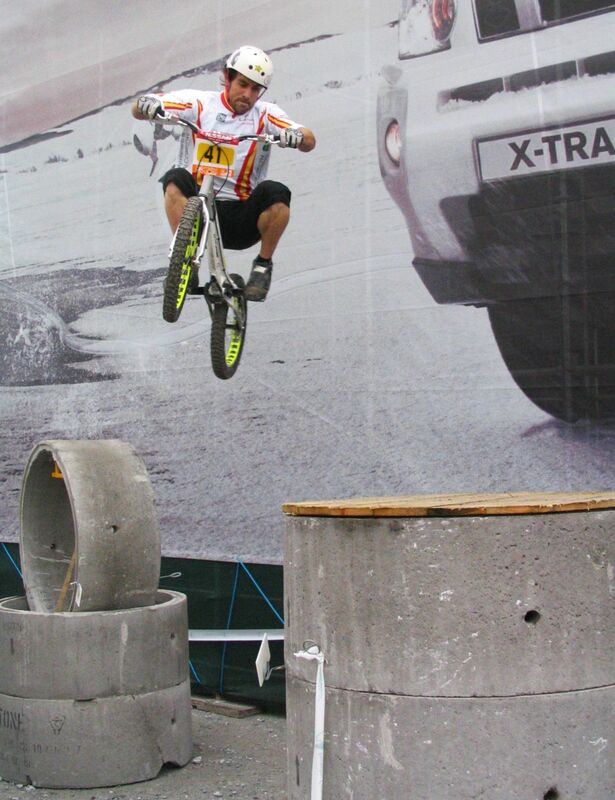 Carles Diaz pulls over a massive gap. Kenny Belaey aims the rear wheel at the other side. 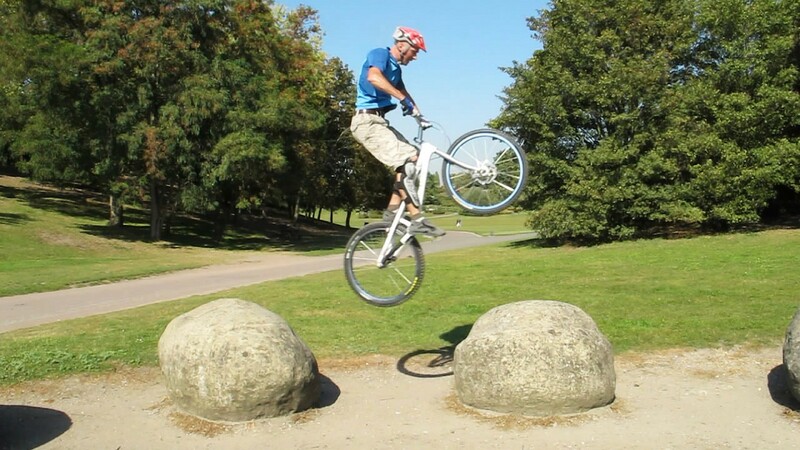 Balance over the rear wheel, about one foot behind the edge you want to leave. Lower the front wheel slightly and crouch back to get extra torque, this compresses the rear tyre. Lowering the front wheel also rolls the rear wheel about a foot, which means you should be pressing the rear tyre right onto the edge when you actually kick the pedal. Unlock the rear brake and pull the handlebars to your abdomen to spring up into extension, thrusting your hips forward as you accelerate on your front foot to perform the pedal kick. 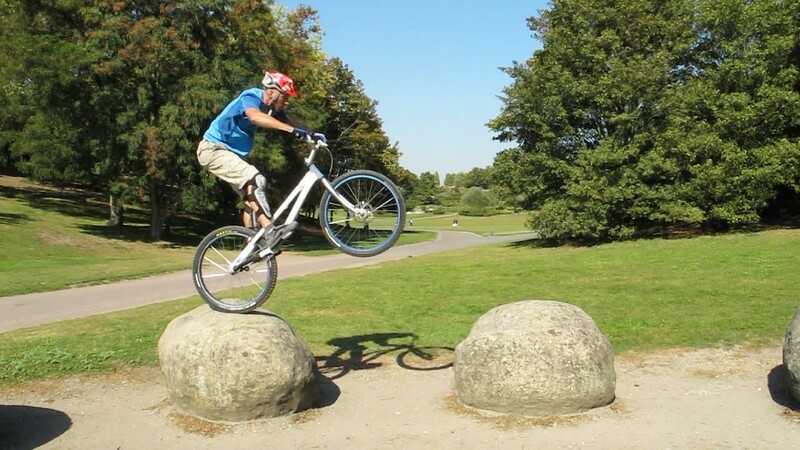 Finish up your jump impulse with a strong pedal kick, a firm quarter crank turn that propels you off the edge, synchronized with the rebound effect of the rear tyre. As soon as you have given your best kick, pull the bike upward in front of you and tuck your knees up to swing the bike forward. 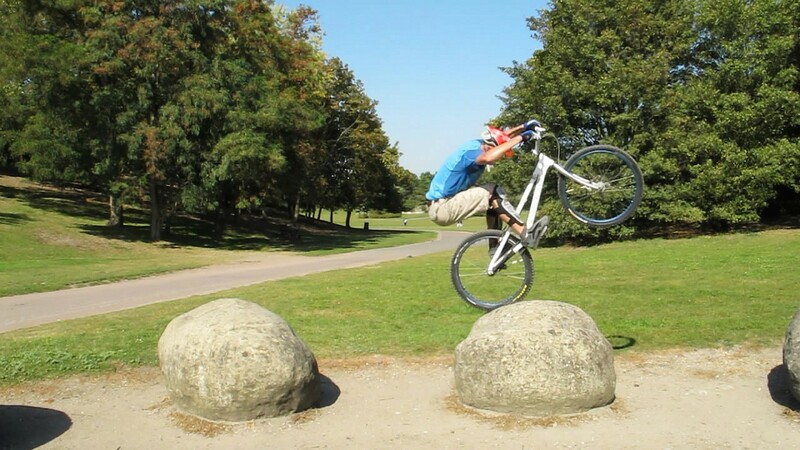 You should end up holding the bike vertically in front of you, ready to touch down with the rear wheel first. Lock the rear brake again before you touch down. As you land, crouch again on the bike to damp the impact progressively finishing in perfect balance over the rear wheel. 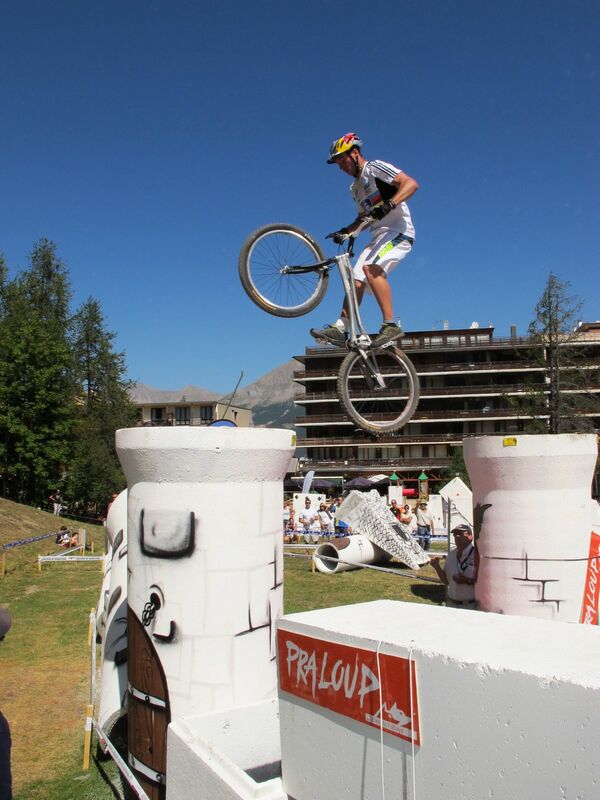 1° Balance over the rear wheel, about one foot behind the edge you want to leave. 2° Lower the front wheel slightly and crouch back to get extra torque, this compresses the rear tyre. 3° Unlock the rear brake and spring up into extension, pulling on the bars to accelerate and thrust your hips forward. 4° The firm quarter crank turn propels you off the edge, synchronized with the rebound effect of the rear tyre. 5° In the air, pull the bike up in front of you and tuck your knees up to swing the bike forward. 6° Lock the rear brake again before you touch down. 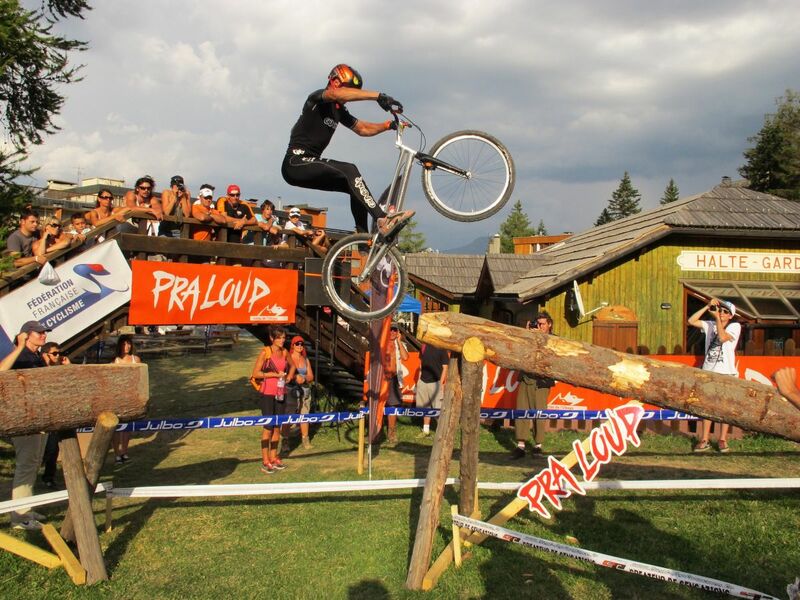 As you land, crouch again on the bike to damp the impact progressively. At the beginning, it's quite common to bounce back upon landing. 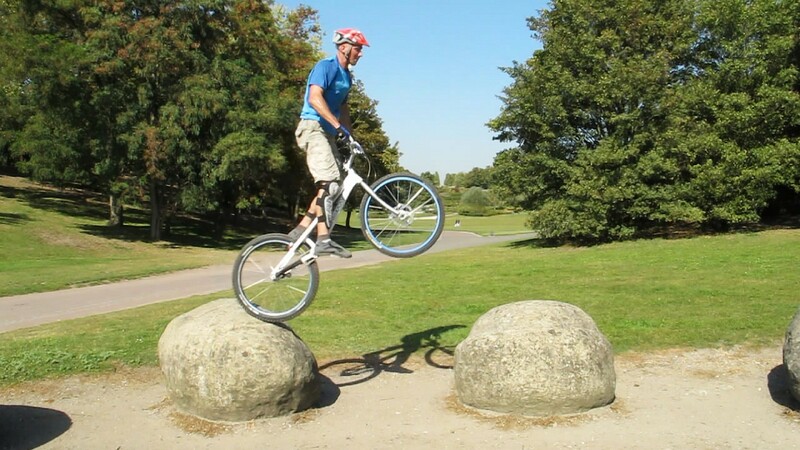 This can happen either because you land too short of your target, due to a lack of impulse during your jump extension or because you stand too rigidly when the rear wheel touches down. Work on being progressive and supple upon landing. To increase your reach over a gap, drop your center of gravity forward before the pedal kick. 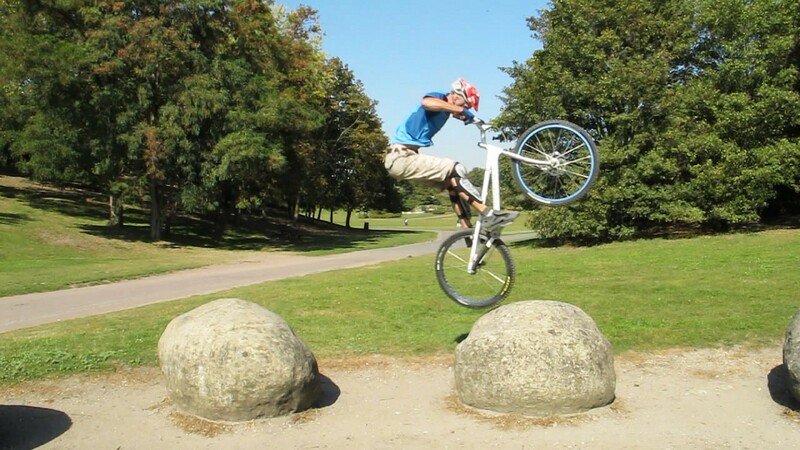 That will bring your centre of gravity further over the gap, effectively reducing the total gap distance over which you have to surge with the bike.